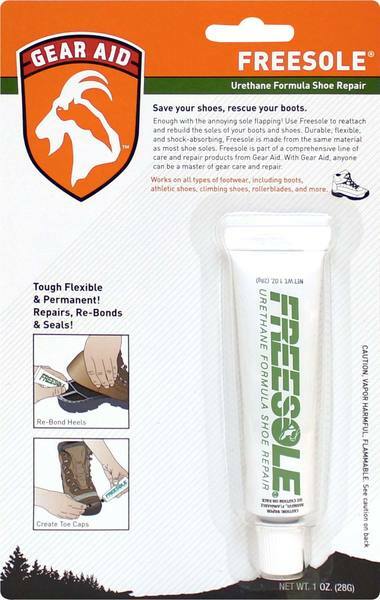 No matter who tries to destroy their shoes first, Gear Aid’s Freesole® can help you repair them even faster. Shoe soles coming apart? Freesole can fix it. Boot heel wearing down? Freesole’s got you covered. Cleats need a little shoe glue? Use Freesole once and they’re good for the long haul. Gear Aid’s Freesole is different from other shoe repair glues. Our patented, urethane formula is made from the same material as your shoe soles—for permanent repairs that outlast whatever abuse you can dish out. Freesole is flexible and waterproof. It’s wear-resistant and unaffected by solvents. So it’s perfect for reattaching soles, rebuilding toecaps or even restoring shoe heels to like-new condition. Freesole works on hiking boots, sports cleats, kids’ shoes, climbing and running shoes— just about every shoe in your closet. Don’t replace expensive shoes with separating soles or worn-down heels. Repair them fast with Gear Aid’s easy to use Freesole. Go ahead and get a set - you KNOW you will need it!